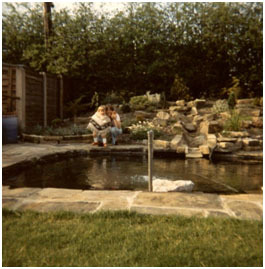 I built my first garden pond in 1972, in the days when only a handful of people in the UK had ever heard of Koi, let alone seen them. In those days it was a shallow, waterproofed indentation in the ground with plants, water and a fountain. It was a few months later before I saw my first Koi! 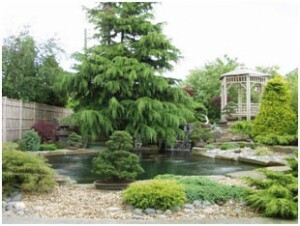 Since then I have designed, re-designed or designed and installed purpose-built Koi pond systems all over the world. Whilst all of my ‘Koi Information’ has been taught by the Koi breeders of Japan, little can be obtained from them regarding practical Koi pond design for all-year keeping. As a result, all of my knowledge in these matters has come to me from actual involvement and experiences over many years. Regarding the items that go towards building a ‘proper’ system today, the vast majority of these, still termed as ‘vital’, all came out of my head originally, then I produced them and promoted them for sale. This is simply because they were not available anywhere at the time I needed them. If it’s filtration you are confused with, it is hard for me to recall all the updated designs I have produced over the years that have all been openly reproduced by others eagerly waiting on the sidelines for new ideas. Take all the ‘specialist’ Koi pond builders and filtration manufacturers around the world and count them all as of now in 2009 to come up with a number. If you conservatively multiply that number by 50, I assure you it is still fewer Koi ponds than I have actually been involved in, all around the world, on a practical basis 24/7 since 1979 for 365 days a year. It should also be obvious to those reading this, I have also made many more mistakes than others in this line of work! At the time of writing I am involved in around eight existing projects. Incidentally today, as a direct result of natural progress, we can design and build FAR BETTER Koi ponds than any others built in earlier days. This is despite the fact that the overall number of enthusiasts involved in the hobby wanting real ponds today has been significantly reduced. I do hope the information on these ‘POND’ pages will be of help if you are planning a new system or are upgrading your existing one. This entry was posted in The Pond. Bookmark the permalink.